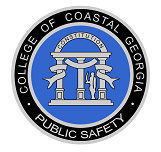 The College of Coastal Georgia Police Department (CCGPD) goals are to improve the quality of services provided, to promote a high level of public confidence, and to enhance and maintain the professional integrity of the Department and its members. In furtherance of these goals, members of the Department are expected to perform their duties within the boundaries of established contemporary legal and ethical standards. The Department is committed to establishing and promoting these standards through clear, written policy statements, rules and regulations, and through the thorough and impartial investigation of all allegations of misconduct or complaints regarding the directives of the department. After your complaint is filed, an Investigating Officer will be assigned by the President of the College to promptly gather all information pertinent to each allegation of misconduct outlined in the complaint. The final disposition will be made by the President and others within the chain of command of the officer involved. When complaints are found to be sustained, appropriate administrative and/or disciplinary action will be taken. You have the right to raise concerns about a CCGPD officer’s conduct. While CCGPD officers must be free to exercise their best judgment and to initiate enforcement actions in a reasonable manner, they must do so in a way that demonstrates respect for the environment and the community in which they perform these functions. Enforcers of the law have a special obligation to respect the rights of others. The College may find after a complete investigation that there is not enough evidence present to warrant administrative or disciplinary action against the employee named in the complaint. Nonetheless, you have the right to make the complaint and to have it investigated if you believe a CCGPD officer acted improperly. Following the completion of the investigation, you will be notified in writing of the investigative findings and whether the allegations were sustained. In light of an employee’s right to privacy, you will not be notified of any specific actions taken against an employee based on your complaint. Complaints made against CCGPD officers, as well as any reports and findings relating to those complaints, will be retained by the CCGPD for a period of at least five (5) years. For more information, call: 912.279.5819. In case of a life threatening emergency call 911.